I don’t know how many page views LeHew’s website received after he posted his article, but I do know he website stopped working for a time, perhaps because it was overwhelmed by server traffic. Now, his article is gone. It was removed almost as quickly as it was posted. The critical article has been replaced…by an apology. Not only has the article been removed but LeHew has demanded that Tom Rich remove a copy of it from his blog. Rich, with LeHew’s persmission, had posted a copy of LeHew’s article during the time in which LeHew’s website was down. Now, LeHew has demanded that Rich remove the copy. Rich has done so. I am left thinking that LeHew removed the article and posted an apology because his job at Shorter University was threatened. LeHew’s critical article, it appears, has been censored. Did the powers that be at Shorter and the Georgia Baptist Convention consider it dangerous? Having read LeHew’s article and observed the candor with which LeHew wrote, I’m convinced that they did. If Mathew LeHew was under the impression that he possessed a certain degree of academic or personal freedom while in the employ of Shorter University, it appears as if that impression was a mistaken one. As LeHew took down his article and issued (what I believe to be) a contrived apology, I wonder, did he think his words were a pleasure to burn? Did LeHew take stock of his situation and come to the realization that he worked for the thought police? To those familiar with recent events at Shorter, a situation like LeHew’s should not come as a surprise. Shorter University is no stranger to controversy. It recently had accreditation and faculty problems of its own but it seems to have come through them. Shorter has been target of criticism from those outside of the Georgia Baptist Convention for some time and, now, one of its own, Matthew LeHew, seems to have caused, from within, a stir. (1) The claim that Brewton Parker remains accredited and will continue to be accredited. In response to this claim, LeHew noted that while technically true, it is also “disingenuous”. LeHew observed that, since SACS has already voted to remove Brewton-Parker from membership, its “continued accreditation is a mere technicality pending an appeal in August (2014).” LeHew claimed that the truth is as follows: “(Brewton Parker’s) accrediting agency has voted to kick (it) out, but (it’s) got an appeal coming up that is literally (it’s) last chance.” LeHew pointed out that Brewton-Parker, despite its loss of membership, continues to assure (students’) parents that situation is fine. (2) The claim that removal of Brewton-Parker’s accreditation is a long process. (3) The claim that Brewton Parker will maintain its accreditation even if the appeals process does not go well. In response to this claim, LeHew remarked, “…that portion of the video (where Caner makes the claim above)…must be seen to be believed. I confess I’ve never seen Caner in person, nor have I heard him speak in public. I don’t know if what I’m interpreting in the video as supreme levels of condescension and smugness are misattributed aspects of his regular speaking tone.” LeHew made it clear that if the appeals process does not go well, Brewton-Parker will have no more opportunities. Interestingly enough, this is the very same claim that Caner himself made in an interview with Gerald Harris of the Christian Index in March of 2014. When asked by Harris about the SACS accreditation review, Caner stated, “…this is the year we are going to hit it out of the park or strike out.” Now, upon learning that his college has swung and missed at strike three, Caner is claiming that there are more innings yet to play! Once again, Caner has been caught making “factual statements that are self-contradictory.” The ever-enabled Caner, it seems, just can’t help himself. In response to this claim, LeHew noted that, if accreditation is lost, credits earned at the school will not be guaranteed transferable and undergraduate degrees granted by the school cannot be guaranteed to count towards graduate school. In response to this claim, LeHew noted that, if accreditation is lost, students will lose the ability to receive federal financial aid through Title IV. (6) The claim that Brewton-Parker will not lose its accreditation for a moment. In response to this claim, LeHew pointed out that even if Brewton-Parker files and injunction to delay its loss of accreditation, it will be unaccredited during the time before the injunction is filed. Of course, if the injunction fails, it will certainly lose accreditation. (7) The claim that Brewton Parker is in the black and has a balanced budget for next year. In response to this claim, LeHew stated, “(Caner) said that (Brewton-Parker College) isn’t in deficit, but doesn’t mention debt. Caner’s justification of BPC’s financial situation is actually very restricted, and his response doesn’t actually indicate compliance with the Principles of Accreditation at all…And if Caner refuses to change anything leading up to the August appeal, then it’s a virtual guarantee that it will be denied, and there’s little reason for a judge to issue any kind of preliminary injunction.” As an accountant, I can appreciate LeHew’s appeal to hard numbers here. LeHew observed that Brewton-Parker’s liabilities were a little over 50% of the size of their assets. In accounting parlance, this is called a going concernproblem. When an organization’s financial statements indicate a doubt in its ability to continue, it’s usually a sign of impending doom. Unfortunately, for LeHew, he is coming to terms with the consequences his own internal decision to post a criticism of a Georgia Baptist Institution. His job may now be in jeopardy, while the future and security of men like former Brewton-Parker Preident Mike Simoneaux and Georgia Baptist Convention President and Former Brewton-Parker Trustee Don Hattaway, who have managed Brewton-Parker into the ground, seem quite secure. Unfortunately, Shorter University itself, also managed (to a degree) by Hattaway is no stranger to the consequences of its own internal decisions. Just a short drive to Rome on Highway 411 from my home in Cartersville, Georgia is Shorter University. Shorter is a Georgia Baptist institution that boasted a Fall 2013 enrollment of 2,636; it offers both undergraduate and graduate degrees in a variety of disciplines. The University, established in 1873, is a familiar site to anyone traveling along Shorter Avenue. “A twisting driveway leads up from a busy street, past a gatehouse to the Georgian quad where twin gates stand. The gates are emblazoned with mottoes: ‘ENTER TO LEARN’ faces outward; ‘GO FORTH TO SERVE’ faces inward.” In 2002, the college was the scene of a battle for institutional control. 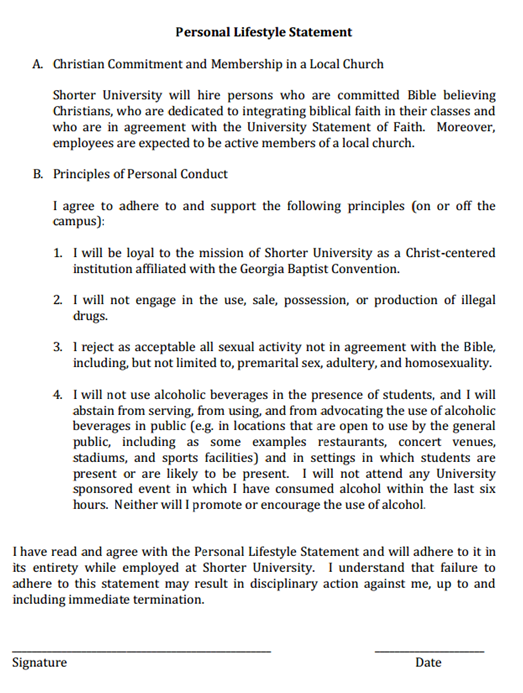 Shorter’s erstwhile board of trustees voted to sever the Universituy’s ties with the Georgia Baptist Convention. A legal contest ensued. In 2005, through a decision of the Georgia Supreme Court, Georgia Baptist Convention control was solidified. The board of trustees was soon to be filled with supporters of Georgia Baptist Convention control. The issuance of the statement resulted in vociferous protests from many liberals and academics. As a Georgia Baptist, I supported the statement…and still do. The fact is there were some professors teaching material in a way that contradicted a biblical worldview. Furthermore, former Chairman of the Shorter Board of Trustees, Nelson Price, lamented that Shorter had a reputation as “a hotbed of homosexuality since the late 1970s.” Such activity and such a reputation have no place in a Christian college…period…end of discussion. As it became apparent that the lifestyle statement would not be scrapped, faculty and staff left in droves. I kept a careful watch of the activity, reading the comments of dissenters and even watching an on-line video of protestors outside the college. I carefully took notice of the names of protestors and dissenters. I Googled them and searched for them on Facebook. My purpose in doing so was to contact them and witness to them. That’s one of the things I love about the digital age. Information and people are closer than ever before. Here in the Bible belt White (and Black) southerns all look like Christians. Public statements against biblical standards help flush out lost people better than a traveling evangelist who tells congregants to bow their heads and raise their hands if they aren’t sure about eternity. The Southern Baptist Confession of Faith is a fundamentalist confession. I’m fundamentalist. Critics like Melissa found little sympathy with me. Sadly, I believe Melissa and many others who would protest such a lifestyle statement to be lost. I was satisfied with the stand that Shorter and Georgia Baptist Convention were taking. At the time, I was a member ofTabernacle Baptist Church. Three members of that church were on the Shorter Board of Trustees. One of those members was my Pastor, Dr. Don Hattaway, who is now the President of the Georgia Baptist Convention. In addition to serving on the board at Shorter, Hattaway was formerly the chairman of the Board of Trustees at Brewton-Parker College, his alma mater. At the time, I was unaware of the troubles at Brewton-Parker. I did not know that my own pastor was involved in running what I’ve come to think of as an inept and corrupt institution (Brewton-Parker). I’m thankful that the Georgia Baptist Convention took a biblical stand with regards to the situation at Shorter; however, there is no excuse for its failure to uphold its own standard of righteousness. The Georgia Baptist Convention held the liberals employed at Shorter accountable but it hasn’t done so with Ergun Caner and Brewton Parker College. If you’re thinking that Georgia Baptist Convention Leadership is going do the right thing where Brewton-Parker and Ergun Caner are concerned, you might want to think again. Financial Instability or Religious Persecution? Rather than taking accountability for and coming to terms with the consequences of Brewton Parker’s internal decisions, Brewton-Parker trustee Bucky Kennedy went on the TV news claiming that SACS is persecuting Brewton-Parker because it is “small, rural, and faith based.” In the light of the real religious persecution that has recently been perpetrated upon Hobby Lobby, Conestoga Wood, and Jake Phillips, Kennedy’s straw man appeal to religious persecution is especially despicable. Rather than take responsibility for the inept management of men like himself, Hattaway, Ergun Caner, and Mike Simoneaux, Kennedy is trying to gin up anti-intellectual sentiment against SACS amongst the South Georgia country folk. This is, very plainly, bad form. Either Kennedy is a buffoon or a deceiver. In either case, he’s proved himself unqualified to run an institution of higher learning. This raises the question of the general competence of professional pastors to lead colleges in the state of Georgia. Exactly what are their qualifications? Shorter was recently put on warning with SACS. Truett-McConnell College, a Georgia Baptist institution run by Ergun Caner’s brother Emir, was recently labeled a “dropout factory” with a 14% graduation rate by Time Magazine. Brewton-Parker has been removed from SACS membership for “failing to appropriate control over all its financial resources.” Think about it, the federal government is going to stop giving financial aid to students to attend Brewton-Parker. The federal government…thinks funding Brewton-Parker…is wasteful. Yet, hundreds of Georgia Baptist Churches continue to fund it every week through the cooperative program. Those same churches pay the salaries of the pastors who have taken it about themselves to become educational administrators. (1) We make no apologies to anyone for being a Christian college founded on a Christian worldview. It also makes no apologies for the gross incompetence of its leadership and its complete and total lack of accountability. This statement is clearly intended to stir the pot with regards to perceived religious persecution. Stop and think about this for a minute. I’m as Baptist as they come. I’m writing a polemic against Brewton-Parker. In fact, most polemics I come across about Brewton-Parker and Ergun Caner are from Christians who demand the Georgia Baptist Convention clean up its act. (2) Brewton-Parker College remains an economic mainstay of the Mount Vernon region. Every business and livelihood in the area would be negatively affected with many failing were Brewton-Parker College to fail. Wow! Every business and livelihood would be affected? Brewton-Parker enrolls less than 1,000 students. It’s not the KIA Plant in West Point! Furthermore, positive economic impact is not a good reason to support an evil institution. Doing so puts money above God. (3) BPC has literally changed communities and regions all over the globe for the past century. Here’s an experiment for you when you go to church next Sunday. Ask people if they’ve ever heard of this world-changing “icon.” Most Georgia Baptist I’ve talked to don’t even know it exists, yet they continue to give wasted tithes and offerings to support it. Should We Pray For Brewton Parker? I don’t think, for one second, that God is with Brewton-Parker College or the Georgia Baptist Convention. Just because a place or organization is “Baptist” in name, doesn’t it make it a God-ordained holy cause. When I examine Brewton-Parker, all the way from the financial scandal to a board of trustees who were obtuse (or crooked) enough to appoint the charlatan Ergun Caner as a school President, I don’t see a God-honoring institution. I see a whitewashed tomb whose iniquity is nearly complete. Let the accreditation removal be the straw that broke the camel’s (that was too big to fit through the needle for being puffed up with pride) back. Good riddance to Brewton-Parker College. I pray that young people will become world changers for Christ despite the machinations of the good ole boys in the Georgia Baptist Convention. I pray that Caner and company will repent and turn away from their wicked ways. Great is the fall of the house whose foundation is built upon the sand. Aside from the apathy of every day church-goers, one of the things that disturbs me most about the culture of the Georgia Baptist Convention is the fear of man amongst the pastorate. These stories I’m telling you aren’t secrets. They are well documented. Why aren’t more pastors speaking out? Is it because they are afraid they won’t get invited to the next big preaching conference? Is it because they are afraid they will not considered for the next posh Georgia Baptist post? (Georgia Baptist College presidents, for example, make six-figures to run very small colleges). Are the pastors running the show more concerned with making money and looking out for their friends that looking after their flocks? Pictures speak a thousand words, so I’ll let these pictures do the talking. Gerald Harris, interviewing Ergun Caner, Harris is the editor of the Christian Index, a Georgia Baptist Convention news service. Influential men like Don Hattaway and Ergun Caner seem to be doing just fine no matter what, but who’s looking out for the little guy like Matthew LeHew? Matthew LeHew told the truth in a helpful way and now he is afraid of losing his job. Matthew LeHew is an ordained minister with a wife to support. Why should he have to live in a culture of fear to keep his job? It’s just not fitting. It’s just wrong. Now, because of the culture of fear and secrecy in the Georgia Baptist Convention, I believe Matthew LeHew has taken the first step (taking down his article) in a life of compromise. It’s a step I was tempted to take. Matthew LeHew with his bride. I know that people often wonder why I spent so much time on the computer lamenting the problems in my local denomination. I’ve three great jobs, a beautiful wife, three lovely children, and seminary classes to study for. Why do I spend my time doing this? Well, look right there at that picture of Matthew LeHew. That’s a man with smiling bride and handsome dog who set out to the right thing and was threatened with job loss…from a Christian institution. One day, my little daughters, God willing, are going to be brides just like Matthew’s wife. They’ll have a family to look after and their husband will be responsible for supporting it. I don’t want my daughters and their husbands to feel pressure to compromise God for money…but I know they will feel that pressure. I hope, when they think of their father, they’ll see an example of a man who resisted it. Do you know I’ve had a Baptist leader try to get me in trouble at one of my jobs for speaking out? I have. I’m quite certain that calling out the people I’ve called out will limit my options when I graduate seminary. So be it. People might think I have a personal axe to grind with Don Hattaway. I don’t. He’s a nice man and a fine preacher. I sat under his preaching for years and had only two disagreements with his exposition. He thinks there was an eye of the needle gate in Jerusalem. I don’t. He thinks Jephthah’s daughter went to serve as a temple virgin, I think she was sacrificed. Such disagreements don’t even matter! It was during one of his sermons that I got under conviction to obey God in believer’s Baptism. It was under his sermons that I got under the conviction to answer the call to seminary…and it was under conviction that I left his church. Doing what feels right isn’t always easy and sometimes it means calling on nice people to do the right thing. Don Hattaway…do the right thing. Matthew LeHew…do the right thing. Georgia Baptists…do the right thing. This isn’t my first article about the Georgia Baptist Convention and its problem of corruption and it likely won’t be my last. I’m staying diligent in my calls for justice, repentance, and accountability. The confederate general, Nathan Bedford Forest, who saved the city of Rome, GA from an attacking Union force led by Colonel Abel Streight had a saying, “Get ‘em skeered and keep the skeer on ‘em.” That’s what I’m doing. Little by little, I know I’m reaching people. People are seeing something. People are saying something. Soon, people will do something. If the problems upon which I opine are ignored, people will forget. I conject that scandals in the church have been swept under the rug for years; high-powered preachers aren’t used to having to answer for gross mismanagement of convention funds. The internet is changing that, for the better, I think. Nathan Bedford Forest was often outmanned and outgunned when he faced an enemy. This was the case when he faced Abel Streight. However, Forest defeated Streight (as he did many others) by outsmarting him. Forest did not play by Streight’s rules. On top of having my job threatened, I’ve had Matthew 18 misapplied to me twice by Georgia Baptist leaders. I’m done playing by their rules. Nathan Bedford Forest told Abel Streight, “All’s Fair in Love and War.” Well, Georgia Baptist Convention, I’m done playing by your manmade, legalist rules of secrecy and fear-mongering. I’m sticking to what the Bible says. The Bible tells me that men like Matthew LeHew should proclaim the truth boldly when they see a wrong that needs to be righted. I know I will. How dare you, Georgia Baptist Convention, make Matthew LeHew feel like his job is in jeopardy while at the same time employing that charlatan Ergun Caner. Remember, the eye in the sky is watching us all.